Most comfortable shoes I ever wore...Well worth the purchase.. I bought these for my 16 yr old son. He loves them! They're stylish and comfortable. What a great combination. My everyday wear. Gives my the support I need along with comfort. Compliments received from complete strangers. As the title says these are beyond stylish and very comfortable. Wear to work and while out for the evening. Even with a pair of basketball shorts. Lightweight. Love the sock feel of the opening. The grandmotion is very comfortable. I have been eyeing this shoe ever since it was released. I finally got it and wore it all day today. I am a bit sad that it was not as comfortable and fitting as my other Cole Haan shoes. I have several Cole Haan dress shoes and they always fit like a glove (size 8) but this pair was a bit too wide and a bit too long. I am wondering if I should exchange to half a size down. I am not sure if the sizing was wrong on this one. I tried thicker socks but still too big. I also bought shoe inserts to see if I can tolerate it better. BTW, my Adidas Ultraboost uncaged sneakers are much much comfortable (albeit less casual) than this pair. Quite honestly, they are the most comfortable shoes I've ever worn. They feel like wearing socks with a good lighweight minimal sole underneath them. They're also perfect for dressing with jeans, slacks, traveling. Slightly upscape yet still casual. You do need to wear a sock that covers the ankle, otherwise, the back of the shoe rubs on the back of your foot. Shoes fit great however there was a small stain on them when received. Customer service took care of the issue this so very impressed. Amazing shoes. Look great and very comfy! This sneaker is pretty nice. I got it to go traveling but I'm still wearing it after getting back. The sole doesn't seem like it will last all that long before signs of wear start showing but that may be because of how I walk (I tend to have some torque when pushing off the ground). The main reason it gets 4 stars though is that the reviews all mention getting compliments, and while I like the sneaker, no one's complimented me on it yet. Completely satisfied with all aspects of this shoe. From the fit, style, and mostly importantly - the comfort. I've received a number of complaints at work and have highly recommended all my Cole Haan shoes. This shoe is very nice to look at but it is not and all day sneaker to wear for comfort. great shoe, love the style, feels a little slippery at first. the back of the shoe slips slightly but a thicker sock did the trick. received a lot compliments, very versatile. I haven't had a chance to wear this shoe other than trying it on once I received it. I like the styling and look forward to the first wear. Great shoe. Good looking and comfortable. Many compliments. I have had these shoes for about a week now. They are very comfortable and stylish... however, after walking in them all day, the sock material rubs up against your Achilles which makes it a little uncomfortable. Great shoe, very comfortable. The sock technology works well this shoe. The color contrast allows the shoes to be worn with Jeans and dress slacks alike. If you enjoy endless compliments, insurmountable attention from that person you may like, or envy from your worst enemy, I recommend buying these shoes now. I LOVE LOVE these shoes. I have tons of Cole Haan shoes and these didn’t disappoint. I walked all over New York City after buying them at Rockefeller center store. They fashionable and just a little bit different to get noticed. The only suggestion I would make is to not wear these without socks or the “no show socks” as the back of the shoe will run against the Achilles area. I also usually wear a 10.5 in the Cole Haan dress shoes/loafers and these are 10 and fit perfectly. Very comfortable shoe that slides right on and feels attached to your feet well. Look awesome, feel awesome, stylish, you can pull off for business casual too. When I first saw the shoes on LinkedIn, I was intrigued and visited a nearby store to try them out. I tried and took home a pair of size 9, a size I usually wear with Nike and other brands. After a day of indoor wearing, the shoes' stretchy material caused my feet to slip and I went to exchange for a 8.5. Thankfully the store was kind enough to let me exchange considering I've wore them for a day. Because of this, I walked out of store with another pair (black) as well. Ever since having the correct size, I have no issues or fatigue from standing all day. In addition the exterior of the shoes held up well from daily wear without creasing. Although the price can be a little shocking at first and the shoes have held up well so far, I will consider the money well spend. Unbelievable shoes. Bought a second pair. Fit well and have gotten many comments asking who makes them. I’ve been looking at this sneaker for a very long time, and after purchasing it, I can easily say it’s the most comfortable sneaker I’ve ever worn. I love the fit and the look of this shoe. It is so lite, that you don't even know that you have shoes on. All of my Cole Haan shoes are so comfortable. Very stylish lifestyle shoe. Very comfortable and I love the stretch material making it great for nights out. Can be worn with multiple different styles from very casual to more business casual. Absolutely stunning design, can't wait to wear this spring and summer. With this white sole you should provide what cleaning solution to use. I would like to try this Grand Motion Woven sneaker as I have already a ZeroGrand Perforated Sneaker style # C23711. Looking comfort and style with sport shoes. They look awesome. I bet they are comfortable. They appear that you can wear for dress casual or with jeans. I have been staring at these for a while. Your sale pushed me over the edge. I am sure I will like!! The most comfortable sneaker I have ever worn and I currently have 18 pairs of sneakers. I want to have a good looking sneaker for traveling. Love the Style and contrast with the brown. First and foremost--comfortable! A nice stylish in-between look that will perfectly pair with jeans or khakis. Saw on FB. Nice style and comfort for casual day. Cool style. Needed something to go with shorts or jeans. Review say they are very comfortable and the color combination is unique. 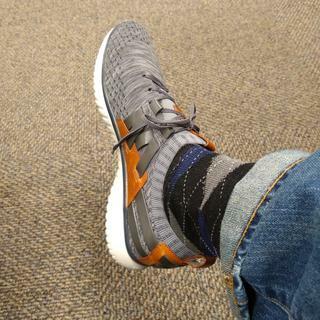 Love the new knit shoes elsewhere so trying yours! Great looking shoe and excellent reviews. The style / look really caught me eye. I'm truly enjoying my first pair of Cole Haans and I expect the same with these. Love the incorporation of leather. Breathable light for summer wear. Unique styling, comfortable and the great Cole Haan fit and quality. Love the design. Looks very comfortable. What millimeter drop is this shoe? When will these be available in wide width? BEST ANSWER: This style in Wide widths is expected to arrive in Cole Haan retail stores and major department stores in mid-February. Try an online search for "Cole Haan GrandMotion Magnet". Use the quotation marks. Is the paint for the sole available somewhere to keep thee shoes looking clean?! Is this a shoe made for athletic activity like running or is it a lifestyle shoe? BEST ANSWER: I would say lifestyle but you can definitely run in them if you needed to. I would not recommend buying this shoe solely for running or training. Lifestyle shoe- I would never run in this shoe. It is a very comfortable stretch fit for a night out, and can be worn with all different styles. I would only use it as a lifestyle shoe. With the leather straps on the shoe it would limit you for certain exercise. Although I am not a runner, I feel that this is a lifestyle shoe. Lifestyle. I wouldn't run in these. Do you make any shoes in narrow width? "B"
BEST ANSWER: This particular style was not manufactured in men's Narrow width. To find currently available sizes and widths, you can use the filter drop-down tabs on the side of the shoe page to shop by size, width, color and more. Did you have a military discounts on any orders? BEST ANSWER: We are happy to offer a 20% discount to our valuable military family of customers! Please click on the link under "Assistance" at the bottom of any page and follow the prompts. I use inserts, can the stock insert be easily removed and replaced? BEST ANSWER: The insole is not removable. We do not suggest trying to remove it as it will damage the shoe. Our footwear is not designed to accommodate orthotics.